popular – segments of the Resort industry! With an estimated 3% of USA families and more than 1 million British families owning a Timeshare membership, this industry is once again a fast growing and popular sector of the Resort industry. Worldwide, it is estimated that 5,400 “timeshare” resorts exist in nearly 100 countries. Fractional ownership of Resorts is also rapidly growing with an estimated 300 resorts worldwide now adopting this model … and many more considering a move to this business model. Both are valid business models and, unlike in the early days of timeshare, the industry is now regulated in most countries. Usual consumer protection rules apply and, in some counties (e.g. USA), salespeople are required to be licensed. Today, many groups in both areas are affiliated with major hotel companies such as Marriot, Wyndham, Disney, Ritz-Carlton, and Four Seasons . Provides: A low cost way to owning a second home or an alternative way to invest in quality property! A rapidly growing sector, fractional ownership divides an expensive property into affordable segments for individuals who each buy a share. That share entitles the owner to stay in a particular property for a certain number of days per year. However, unlike standard Timeshare, the number of guaranteed days is higher (often from 2 to 8 weeks). Properties are typically luxurious (e.g. Residence Clubs) and therefore the entry point is generally much higher than for Holiday Club ownership. 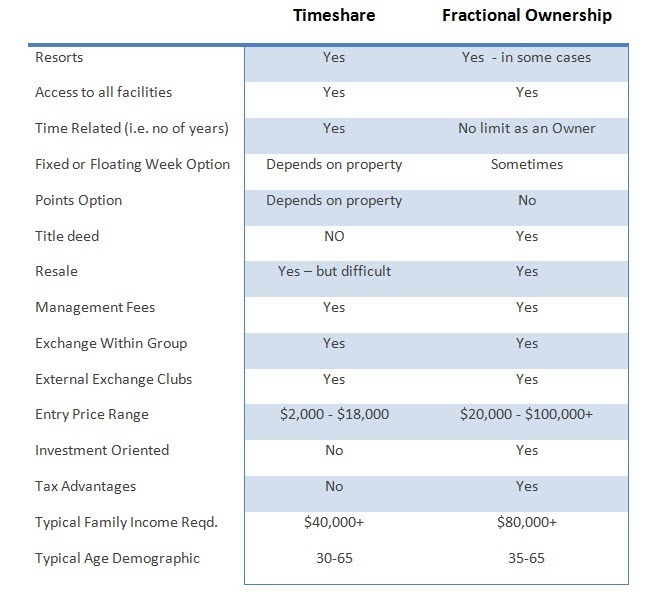 Fractional owners enjoy priorities and privileges, such as reduced rates, priority access on holidays and income sharing. Fractional ownership has been used as an “investment syndication” methodology in the property development sector in which case an exit time frame is specified at the outset. Timeshare – also referred to as Holiday Club Ownership by some Resorts – allows buyers to purchase “an increment of time”, typically one week, in a condominium, villa or apartment type of furnished vacation accommodation. In some cases, you can purchase “points” which can be converted to time. Resorts can vary from 3-Star to 5-Star and typically, most have all the amenities which people seek when holidaying. Traditionally, the industry strove to secure timeshare owners on an extended term – often 15 -30 years. However today, many resorts provide a 2-3 years entry option at a dramatically lower price and this is fueling demand as a lower entry price makes Holiday Club ownership very affordable. Please Note: Every property / club is structured and managed in a different way and therefore comparisons need to be made on a property by property basis. The above is a very cursory comparison and, once again, I stress that you need to look at each case on a property by property basis. The good news for consumers is that Resorts everywhere are keen to have you join their membership clubs and therefore are often willing to give you no cost introductions on the basis that you undertake a “no obligation” presentation on their membership option. In some cases, this may be through special offers at dramatically reduced rates (better than any offer you will find through travel portals), a weekend stay at no cost, and or a full week’s stay for a dramatically low price as demonstrated in our Value Holidays program. These “try-before-you-buy” options are highly recommended as they give you the opportunity to become totally comfortable with any decision you make. The key is to remember that this is an industry which has dramatically cleaned up its act and now must comply with regulations within each market. This is why there is a renewed vigor and interest in this sector.